The aim of the Kinsale Community School Art Department is to develop our students’ creativity, imagination and independence. We seek to develop their aesthetic awareness and their appreciation of visual art, both contemporary and historical. Our students are given opportunity to express themselves through a wide variety of disciplines and materials, for example through drawing, painting, 3D modelling, batik, printmaking etc. Not only does this occur in the classroom but through extracurricular activities in the school also such as stage design for the school musical and fashion design in Junk Kouture. Develop skills in drawing, painting, graphic design, 3D (construction and modelling) and crafts such as batik, pottery and printing. Understand and use artistic processes from researching themes, creating and analysing ideas to experimenting with materials and art processes to realisation of finished artworks. Expose students to a wide range of images and art practices and develop their own individual tastes in art. To be prepared for their exams and be able to know and use their individual strengths. In senior cycle to gain knowledge in art history and develop their own opinions and tastes in art. The vocabulary in art is worked through all classes from keyword sheets to art history essays. First Year- Smaller simpler projects are planned for first years where they will learn the basic skills and an understanding of the processes needed to be developed for junior cycle. All first years do an option block of 15 weeks of the year with one double a week. 1styear work is made up of shorter 1 to 2 class projects and is broken into shorter activities often with the use of worksheets interspersed with demonstrations and short discussions. · Observational drawing developing skills in pencil, shading and colour through oil pastels and colour pencils. Sketchbooks are used in order to promote critical thinking, creativity and in order to allow students to develop their ideas further than they would have previously in primary school. Art is then an option subject chosen in second year for Junior Certificate. · Batik using with a preparatory sheet. • Research artist and assemble support study sheets. All students do a block of art in TY, each group has a 15 week block each, with one double a week. A project or series of tasks is usually set by the subject teacher allowing for a mixed ability of students and the allocated timeframe. 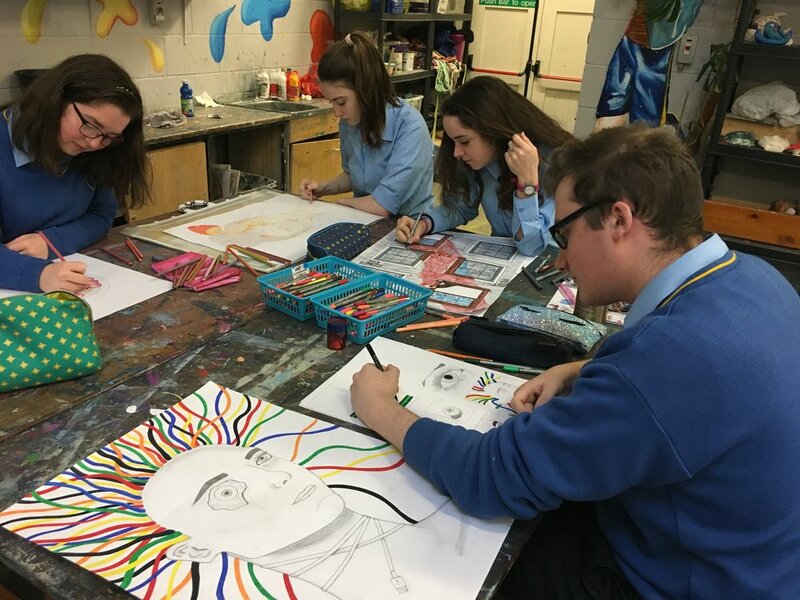 Projects such as the stage design for the school music are completed in class, as well as art competitions like Mental Health Ireland and Doodle for Google. Leaving Certificate Applied- Follow the module descriptor with the subject teacher setting the art process based on their own specific skills and the ability and interests of the student group. The Local Environment is approached with brainstorm, research, painting tasks and skills and realisation of an acrylic painting. Fifth and Sixth years have two doubles and one single class per week. These classes are used for both practical work and for Art History and Appreciation. · Life drawing using past paper poses concentrating on proportion, composition, form and 3d quality in both 15 and 30 min sketches. A variety of mediums are tried to challenge students and to find the medium that suits them best. · Imaginative composition using the sample paper themes and workbook. · Appreciation covering street art, public sculpture, museum visit and CGI with motion capture. · European art Romanesque and Gothic architecture and decoration. Giotto and Early Renaissance background, philosophy sculptors and painters. · Craftwork using the pilot project titles. Student choose their craft between poster, lino, modelling or batik. · Still life or imaginative composition using last years paper.prep , development sheet and realisation concentrating on developing skills with emphasis on composition. · Appreciation developing on last years museum visit to the Glucksman, an optional visit to Dublin IMMA and the National Museum Kildare St. and this year to the Crawford Gallery, CGI and motion capture. · European art. Early Renaissance background, philosophy sculptors and painters. School musicals are run regularly in collaboration with the Music department, and with the local community, parents etc. The Art department design and paint the sets and props for these shows. Most of this work is extra – curricular and done outside of class time with the help of pupils who volunteer their spare time. Last December a homage to Hairspray was shown, with a bright, 60’s themed, colourful set. Murals in the local community have included Summercove primary school, a local cattery and we are presently planning one for the local youth cafe and hopefully in the grounds of our new school. We have also taken on 2 exhibitions with the History department and local community in recent years to commemorate the Centenary of the sinking of the Luisitania and the centenary of 1916. This invited the whole school to partake and involved the Woodwork department, Home Economics, German as well as Art and History. Kathleen Fitzpatrick and Diarmuid O Donovan presented the work in collaboration to feilte beaga in our school entitled “The development and use of public exhibitions to deepen students understanding of a subject”, and to the teaching council through a webinar. These tripsare an important element of the awareness of the art process and appreciation and are integral to the senior cycle course. 5th and 6th years go on a yearly gallery visit to either the Crawford or Glucksman galleries. We have also included a visit to either St. Finbarrs cathedral or Cork public museum in Fitzgerald Park. Visits to Dublin museums are optional and take place on a Saturday in January. Last year 6thyears went to Freud in IMMA and the National museum in Kildare st. in January.